Originally christened the Diasynchronoscope in a nod to a rich ancestry of mechanical devices of wonder, the D-Scope is a new tool for investigating the expressive power of embodied screen-less animation. It takes place in an architectural black-out where prepared 3D objects are arranged in a way that they change incrementally in shape and/or position. Although nothing in the space actually moves, the objects are revealed through serial illumination in the dark room, sequenced using the technique of projection mapping. This technique enables creation of a dramatization over time, encouraging the common perceptual shortcuts of a participant to create sequences and narrative from static abstract objects. Fig. 1. The installation Libretto. The visual experience is enhanced by synchronized and spatialized sound, and often interactive elements, where participants can initiate or generate changes in sound or narrative through actions. It is a hybrid and emergent new medium, a portmanteau seed spawned by the traditional arts of music, sculpture, film, and interactive installation – and because it is a new and immersive medium, it is far harder to describe on paper than to experience (one installation, Libretto, was shown at the SAS conference in Canterbury, UK in 2015). The ontological roots of cinema as an ‘image system’ require: a) a camera for recording images; b) a screen for showing the images . There is an abundance of sociological and semiological film theories that interrogate the meaning of the image, and whether filmed images are construed as representation or simulation by the audience. Since the screen allows such a rich interpretation of self and mirrors of self, film has also drawn significant analysis in psychological terms. Because film is an ‘image system’, film scholars tend to dissect the image. What if there is no image, merely objects that just ‘are’? In the D-Scope, the image is irrelevant as it is not constructed from images, but singular, visible and concrete 3D objects appearing to move undergo transformation by being spaced in very particular ways. The objects themselves can vary in construction and form, but the magic of the medium does not lie in the objects, whereas in the time/space they are made to occupy. Here, objects that appear stable and that act according to natural laws can enter into the uncanny. Materiality and solid relationships can dismember, morph, glitch, reverse time, or defy gravity. Thus, the artworks invoke both transcendent and immanent planes of aesthetic experience, because participants perceive real objects moving in real time, but the way the objects animate leaves room for creating the ineffable. In the 1980s the metaphysical philosopher Gilles Deleuze rejected “linguistic” as well as psychoanalytic models of film theorization in two monumental books on cinema, Image-Mouvement (Cinéma I) and Image-Temps (Cinéma II) . Here, he proposed a new approach to film theory: films do not think with simple images, but with movement-images and time-images. 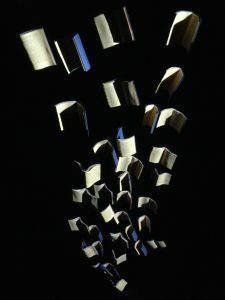 Extrapolating from the work of Henri Bergson and drawing on his own philosophy of repetition and difference, the Cinema books are not about the ontology of the screen, but other ontologies that Deleuze held most essential to the medium: film unfolds in time and is comprised of ever-differentiating planes of movement. For Deleuze, the film was no longer about the image alone, the image was attached to qualia of movement in space over time, and that qualia itself was also open to semiotic interpretation. The idea of the qualia of unseen spaces between images being important in their own right holds particular resonance for all animation practitioners, whose craft and art lay in interpreting this space when they create animation frame by pain-staking frame. Canadian animator Norman McLaren pointed out that these invisible in-between spaces are crucial to the art of the animator . The ontology of the D-Scope lies in the gaps between objects, because these lacunae form its structural essence . The D-Scope, like film, and conventional, screen-based animation, communicates through apparent movement, but the audience experience is compellingly different because it allows for richer sensual interaction in all dimensions, preserving features of perspective, focus, depth-perception and parallax. The works are site-specific and often interactive; there is a sense of ‘authenticity’ as defined by Benjamin; of being in the presence of something new, ‘real’ and immediate that you can walk around and touch . Although it has escaped the screen, the D-Scope would not exist without its screen-based ancestor: because of film, we are familiar with the camera becoming the eye of the spectator. In the D-Scope, modalities are reversed, and the mobile spectator replaces the camera. This means that all camera film tropes are potentially translatable to the D-Scope, and particularly to an audience shaped by screen-based media over a life-time. Modern audiences are so familiar with tropes of cinema, and in particular cameras changing speed or reversing, we accept the same tropes in ourselves although there is no mediating lens or screen. This offers a philosophically intriguing puzzle: has the ubiquity of the screen and image-based media fundamentally reshaped our perceptions of time and space? Dr Carol MacGillivray is an artist and researcher‚ who comes from a background of animation and film editing and has spent 20 years working across documentary‚ drama‚ music videos‚ and commercials. She worked as senior lecturer in animation at the University of West London‚ going on to become Associate Dean of Research and Enterprise in the Faculty of the Arts at that university in 2009. An increased interest in combining theoretical research and practice led Carol to undertake a PhD by practice in Arts and Computational Technology at Goldsmiths University. Her PhD thesis, Choreographing Time: Developing a system of Screen-less Animation researched the grammar of the D-Scope as a new medium. She is a visiting lecturer at the Royal College of Art, in the School of Communication and exhibits as an independent artist under the name Coral Woods. Bazin, A. (1971). What is cinema? Vol. 1 & 2 (Hugh Gray, Trans., ed. ), Berkeley: University of California Press. See respectively: Deleuze, G. (1983). Cinéma 1. L’Image-Mouvement. Vol. 1, Paris: Les Éditions de Minuit; Deleuze, G. (1985). Cinéma 2. L’Image-temps. Vol. 2, Paris: Les Éditions de Minuit. Canadian Animator, Norman McLaren in interview (Solomon, 1987), p. 11. Benjamin, W, (1936). The Work of Art in the Age of Mechanical Reproduction, London: Penguin Group; reprint 2008. MacGillivray, C. & Mathez, B. (2013). “The Diasynchronoscope: Bringing a New Dimension to Animation”, in CONFIA (ed. ), Proceedings of the International Conference on Illustration and Animation, Porto: Edição IPCA, pp. 367-379. Thank you for this thought-provoking post – and for reminding me of the lovely installation of Liberetto at the 2015 SAS conference. I wasn’t able to access the link in the post – I found this video – https://vimeo.com/134285830 – which features responses of SAS members and attendees in addition to showing the work. I am reminded of pre-cinema uses of image and space as I read your post, and when I experienced the installation. The cave had come to life through an evolved craft of light choreography and image placement. Oh yes the visual experienced is enhanced this blog is more like a book but a good one as the Animation lovers , and animators can increase their knowledge by reading these.